I am using SharePoint 2010 server. Your changes could not be saved because this SharePoint Web site has exceeded the storage quota limit. You must save your work to another location. Contact your administrator to change the quota limits for the Web site. When I go back to my site I still getting the above error. Anyone can tell me what I did wrong? 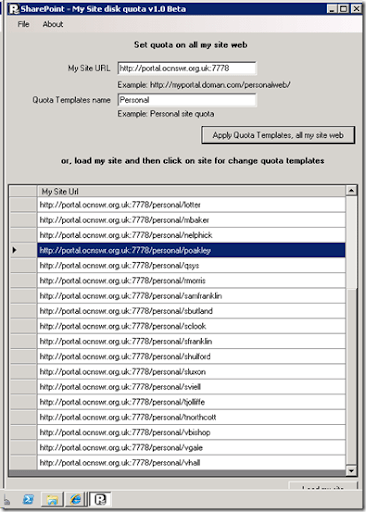 Application for change user profile site disk quota, if you have too much my site web. Because SharePoint implicitly cannot change my site quota templates for all my site web at once, you can use this applications. This project is beta version. You can read more on this blogs.